Rome is surely one of the most beautiful cities in the world. But have you ever seen it at night? 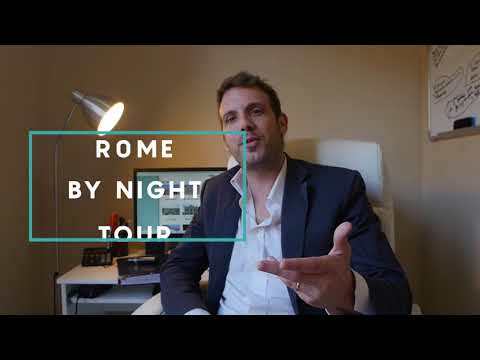 Sitting comfortably in a deluxe vehicle, we will follow an unforgettable itinerary, witnessing the ancient origins and the successive cultural and historical stratifications, which characterize the city of Rome. But all of this at night. The city will be all lit up for you… let’s say… to visit it under another point of view. PICK UP TIME // Suggested 7:00pm (it is flexible then you decide whenever during the day). THE ETERNAL DRIVE // After the Colosseum, down by the Circus Maximus, through the Road of the Temples and over to Piazza Venezia with a wonderful picture opportunity of the so called “Wedding Cake” (The monument dedicated to Victor Emanuel II, the first kind of Unified Italy). THE TREVI FOUNTAIN // Go and toss your coin and wish to come back to the Eternal city. With the sparkling yellow light on it you will be enchanted by its beauty. 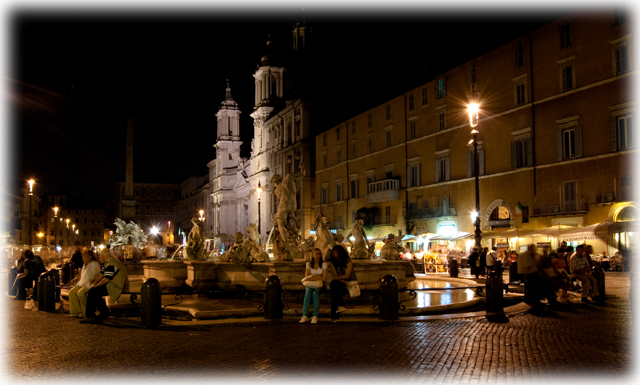 PIAZZA NAVONA // Crowded and lively during the day, packed and picturesque during the night. Street painters and artists giving this 17th century touch to the Square. SAINT PETER’S SQUARE // Well, stopping in front of the most amazing basilica in the world is something that you cannot miss out! At night it has got a complete different charm. JANICULUM HILL // The hill that overlooks the city with its square dedicated to the father of the Unified Italy – Giuseppe Garibaldi. The view of the Eternal City from up there is simply breath-taking! You’ll be escorted by your English Speaking driver who will explain to you all points of interest. But please note that they are not guide. They cannot enter the sites with you by law. THIS IS THE BEST WAY TO GO! Consider that in this tour the time is limited therefore there will be a little bit of driving-by!